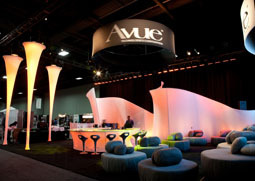 Precon Events created an exhibit that really stood out for Avue Technologies at FOSE 2012 in the DC Convention Center last month. 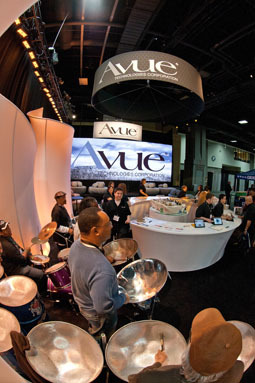 As the head sponsor for the show, it was important that Avue could be easily seen from the other side of the show floor. 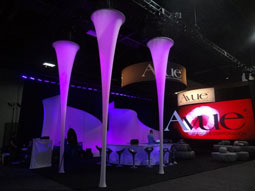 Precon's lead designer, Mike Kurman and production manager, Steve Krauthamer, rented Ice Needles and large Crescendos to create a simple and yet dramatic backdrop for the lighting. 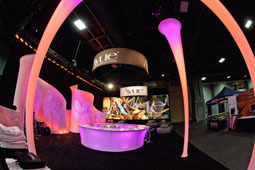 Event EQ built a lighting rig with over 100 LED Colorblasts and almost a dozen moving lights. 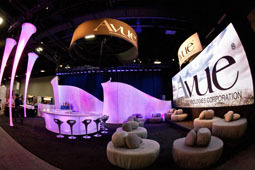 The 30' x 50' booth was complete with an open bar, a steel drum band, a 10' x 30' LED wall showing zen-like natural scenery, and custom sofas that looked like boulders to create a comfortable environment.